I think I secretly want an afro...not so secret anymore. I call my little girl's hair her "Fro Fro" and she calls everyone's hair that now. "Let me do your fro fro, I am going to make you Elsa!". Mission accomplished. Purple Afro Girl is now in my shop! 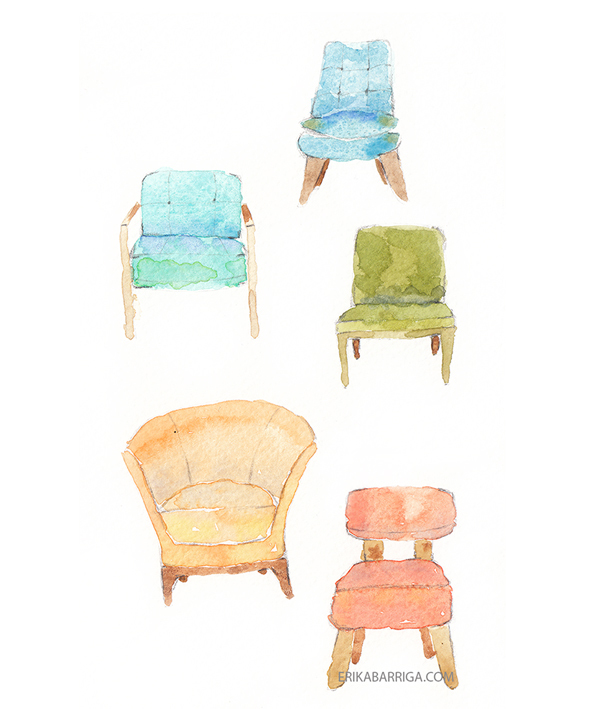 Two new prints are in the shop, the one above called "5 Little Chairs" and a succulent painting called, "5 Little Cacti". I've been working overtime so I can re-open my shop and today is the day! 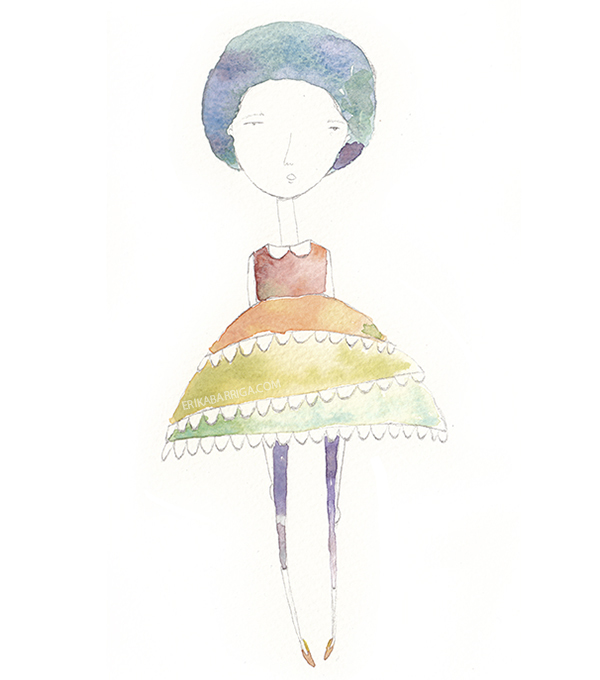 I now have three new mixed media illustrated watercolor girls added to the shop. The one above is called Orange Top Knot Girl. Also, I'm offering more sizes: 4x6, 5x7, 6x8 and 8x10. As a thank you and to celebrate I have a 20 percent off promo going on, just enter APRIL2015 as the code. Promo ends Sunday, April 5 at midnight MTN time. Follow me on Instagram (@fluximagery) and once I reach 300 followers (I'm at 219! ), I will have a giveaway (shipping worldwide). Thanks for your support and have a great week! Hi hi! Vacation is over and the shop is now re-opened for 2015. I missed it and I hope you did too. What new prints will be created and added this year? Exciting times! New Channel Video and a New Print! I've been a busy girl over here trying to figure out how to record and edit video on my iPad. I set up my YouTube channel, fluximagery, (like and subscribe!) and two videos are published so far. 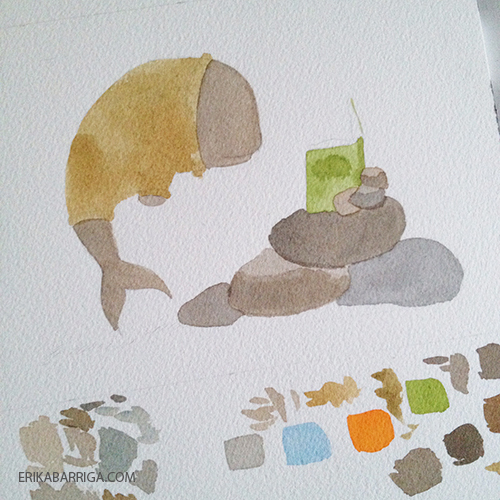 I'll show more works in progress in the future. There is no sound because that part was driving me insane with copyright infringement and all that. One day I will have sound on my videos, mark my words. If you have any feedback, leave me a comment, I would love it. 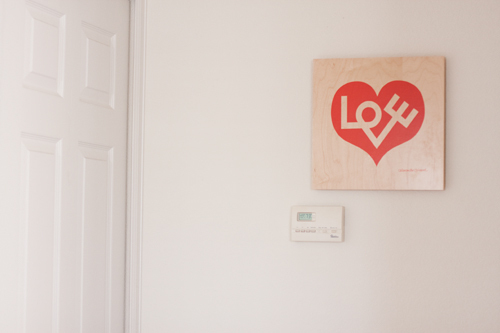 Also, this print is now available in my Etsy shop right here. I think I have sweaters and all things winter on the brain because I'm not wearing these items myself. I'm in full maternity gear but form fitting and representing the bump. My bunnies and bears get all the fun this season....and all the bulk. 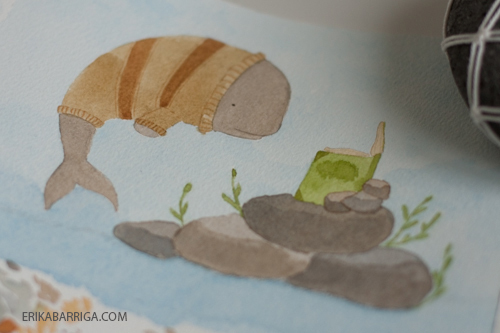 I'm sure you have heard of bookworms, but have you heard of bookwhales? They are a real little subculture and so interesting. 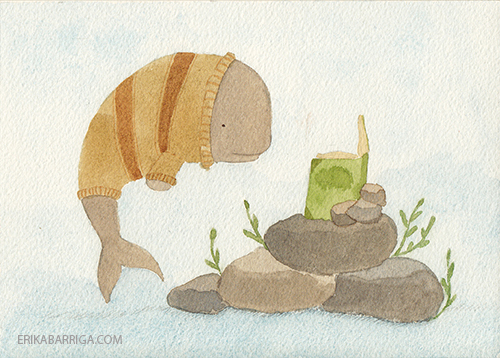 These particular whales gather in their cozy knits and talk about their favorite stories. They chit chat when they attend their weekly book clubs of course. Fascinating. 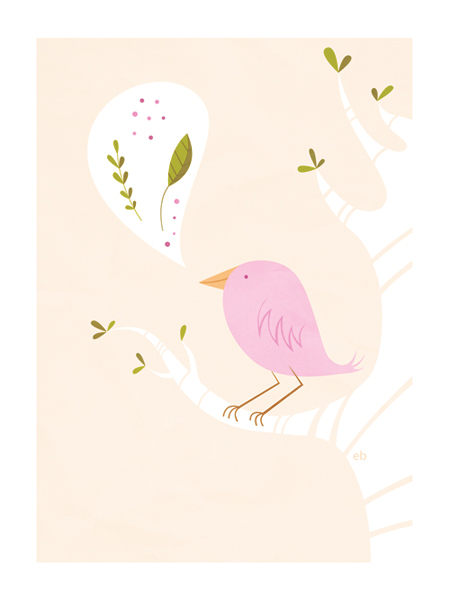 This cute little guy is available in my shop. I would love it if you would say hi, comments are my favorite. Have a great day! My eyebrow will eventually stop twitching. It has to. Right? 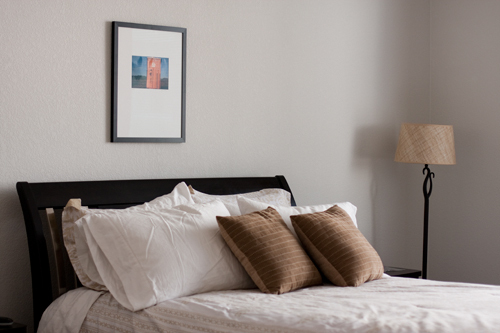 I have pics of our pale gray bedroom paint and the key wall project. 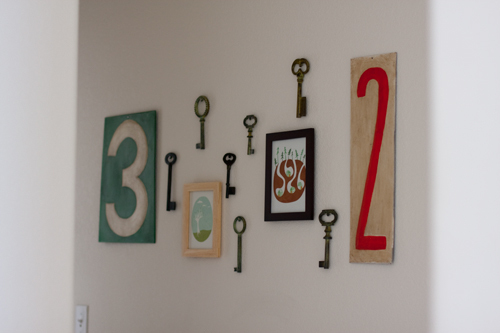 For the key wall I found the numbers at Anthropologie, the keys at Pottery Barn and the limited edition prints are available in my store. I'm just happy. Can't help it I guess. Happy Thursday! This is my attempt for the theme of Expire for Illustration Friday and it is also an entry for 52 Designs. Winter has expired, hello spring! Come as fast as you can please. We got dumped with snow with a nice March spring storm. I say that with a lot of sarcasm included. This illustration is available as a limited edition print in my shop. Now I'm off to go do a boot-camp workout with my friend at her gym. I am slightly scared, not sure how difficult this is going to be but she assures me it won't be that hard. We'll see. Going to check out fabric at Fancy Tiger so I can sew a cute cover for my printer so it is protected from dust. Going to see the Liberty of London line at Target! Wish me luck with the workout, goodnight!